Tools and resources to help you and your family prepare for any disaster. You will also find information about current hazards and important information on what to do before, during and after public health emergencies. Community Resilience relies on the ability to develop informed, empowered, and resilient health care systems and residents. Healthcare System Preparedness ensures that there is capacity and capability for provision of critical public health and medical services in order to reduce the potential for adverse health outcomes during any event. 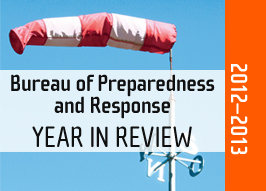 Ensuring that Florida's public health and health care system along with our supporting partners are properly trained, practice their response roles, perform response duties, and are prepared to respond to any and all hazards. Leveraging resources through proactive planning and strategic collaboration with a variety of local, state and federal partners to evaluate and prevent potential health risks from chemical, biological, radiological and physical agents in the environment. Provides for a systematic framework to develop, implement, evaluate, and improve plans across the emergency management cycle. Florida's disaster response teams as well as the resources to stay informed and ensure that plans, personnel, equipment, and systems are in place to protect the safety and health of responders. Licensing and inspection of facilities that use radioactive materials as well as monitoring Florida's radiological environment.